I know I shouldn’t play favorites when it comes to our wines but boy was I impressed when we did a complete vertical of Papa’s Block Syrah a while back. 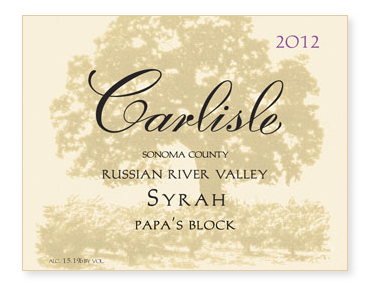 Each wine accurately portrayed the vintage and each was consistent in its display of terroir. And most importantly, each wine was delicious! Not much more you can ask from a vineyard and wine. For the 2012, we picked October 19th. Yields were right on target at 3.5 tons to the acre. As usual, we did about 30% whole cluster to increase mouthfeel and aromatics. Pressed 21 days later to all French oak, 27% new. Bottled unfined and unfiltered.